“Since we’re cooperating with Russia in struggle with terrorism, we’re given some privileges to it as regards the landings and takeoffs of combat aircraft and we’ll consider these privileges for Russia again when we feel it necessary and if Russia makes a request for them,” he said adding that Ithe Iranian authorities would consider the current circumstances and would make an appropriate decision. In August, the Russian Aerospace Force used the Iranian airbase at Hamadan for the first time for delivering strikes at militants in Syria. Iranian Defense Minister Hossein Dehqan said that Russia can use Iran’s Hamadan airbase to strike jihadist targets in Syria for as long as needed. Russia can fly jets from Iran’s Hamadan airbase to strike jihadist targets in Syria for as long as needed, Iranian Defense Minister Hossein Dehqan said Saturday. “The decision will remain in place until there is no need in it,” the minister told reporters in response to the question for how long Russia can use the air base, as quoted in a ministerial statement. On Tuesday, Russia used the Iranian base for the first time in its anti-terrorism campaign in Syria. The Russian jets carried out airstrikes against Islamic State and the Jabhat Fatah Al-Sham, formerly known as Nusra Front, jihadist groups in Syria. The Iranian Hamadan air base has been receiving Russian aircraft at the Syrian government’s request to tackle terrorism, Iranian Defense Minister Hossein Dehghan said. According to Dehghan, the use of Hamadan air base is the result of mutual cooperation at Syria’s government request. “Reception of Russian aircraft at the airbase in Hamadan is carried out in the framework of mutual cooperation and the fight against terrorism at the request of the Syrian government,” Hossein Dehghan said as quoted by the Tasnim news agency. Iran has no current program to buy the Russian S-400 Triumf air defense systems offered by Moscow, Iranian Defense Minister also added. “The Russian side has offered Iran S-400 systems, but we do not have the program on their acquisition,” Hossein Dehghan said as quoted by the Tasnim news agency. On August 15, an undisclosed number of the Tupolev Tu-22M3 supersonic long-range strategic bombers and Sukhoi Su-34 strike fighters left the airfield in the Russian town of Mozdok located in the Republic of North Ossetia-Alania and landed at the Hamadan airfield in Iran. Russian bombers deployed to Iran have carried out several massive airstrikes against Daesh and al-Nusra Front targets in Syria this week. 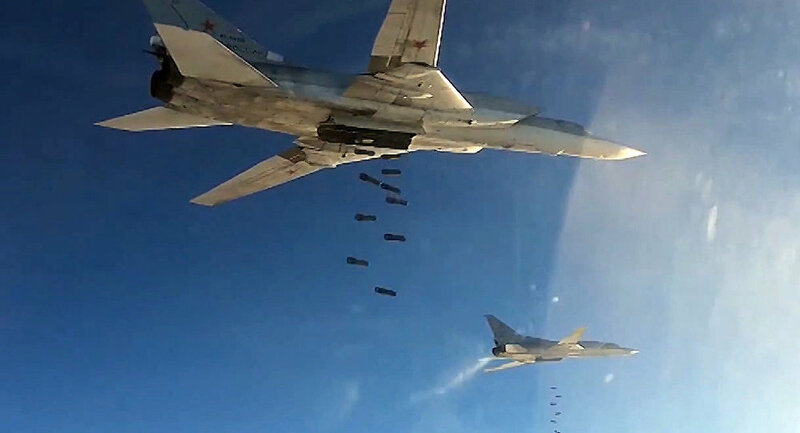 On Thursday, Tu-22M3s and Su-34 destroyed five large depots with weapons, ammunitions and fuel, six command and control centers and armored military hardware in the Deir ez-Zor province, the Russian Ministry of Defense reported. “A large number of militants” were killed in the operation. While the West struggled to reconcile itself to the unexpected Russo-Turkish thaw, the agreement struck by Moscow and Tehran to bolster bilateral military strategic ties has literary caught Western capitals off guard. In accordance with the deal concluded between Russia and Iran, Moscow deployed its Tupolev Tu-22M3 long-range strategic bombers and Sukhoi Su-34 strike jets at the Hamadan airfield in Iran to enhance the countries’ joint campaign against Daesh (ISIS/ISIL) in Syria. “Russian bombers flying from an Iranian air base struck rebel targets across Syria on Tuesday, Russian and Iranian officials said, dramatically underscoring the two countries’ growing military ties and highlighting Russia’s ambitions for greater influence in a turbulent Middle East,” the Washington Post reported on August 16. What lies behind Moscow’s decision to use Iran’s Hamadan airbase to attack terrorists? And why is the West fuming over the Russo-Iranian move?”Tehran’s decision to allow Russia to use the Hamadan airbase will greatly facilitate the operations of the Russian Aerospace Forces against Daesh [ISIS/ISIL],” The Saker, a US-based top level European military analyst, told Sputnik, highlighting three major “technical” reasons behind the move. “First, using Hamadan, as opposed to using airfields in southern Russia, will greatly reduce the flight time to targets in Syria, allow the Russian aircraft to conduct more fuel efficient missions and to carry heavier weapon loads,” he narrated. “No less important is the fact that using Hamadan will greatly complicate the US/NATO efforts to warn their ‘good terrorist’ allies about incoming Russian airstrikes: it will be harder for the US to detect Russian aircraft and when they do, they will have less time to warn their proxies on the ground,” the military analyst explained. In this photo taken on Monday, Aug. 15, 2016, A Russian Tu-22M3 bomber stands on the tarmac at an air base near Hamedan, Iran. “I would say that Hamadan is an ideal location to operate from for the Russian Aerospace Forces,” he emphasized. But that’s half the story, according to the military analyst. The Saker called attention to the fact that the decision to deploy Russia’s bomber at the Hamadan airfield is also an important symbolic move. “The main reason for the Russian decision to use Hamadan is not only a technical one. The fact that the Iranians have now publicly made this base available to Russia indicates a deepening of the strategic collaboration between these two countries and a stronger Russian commitment to the defense of Syria against the foreign invaders, something which Tehran had been wanting the Russians to do for a long while,” The Saker highlighted. The military analyst pointed out there the Iranians feared that Russia’s commitment to the Syrian peace process could be used by Daesh and al-Qaeda terrorists to regroup, rearm and reorganize. However, the Kremlin’s recent move has dispelled Tehran’s doubts.”The Russian move to Hamadan indicates that the Kremlin is serious about hitting Daesh as hard as need be to protect Syria from the Takfiri [radical Islamist] invasion,” he remarked. “I would characterize the relationship between Russia and Iran as a strategic partnership of two different but equal parties who collaborate with each other but who retain their own, sovereign, agenda. This is not a formal alliance but, in a way, this is even better as it is something much more flexible and viable in the long term. This is also similar to the kind of strategic partnership Russia has with China, even though the one with China is far deeper and really should be called a ‘strategic symbiosis’,” he elaborated. It should be noted in this context, that Iran is playing a vital role both in the China-led One Belt One Road (New Silk Road) initiative and in the Russo-Iranian-Indian North-South International Transport Corridor project aimed at bolstering Eurasia’s integration and economic development.Iran is emerging as an influential geopolitical player in the Middle East, committed to the multi-polar world concept. Enhancing its relations with Turkey and Russia Iran is pushing ahead with the idea of the trilateral coalition aimed at resolving the Syrian crisis. However, such a coalition does not fit into the US-NATO plans. “The West is clearly unhappy about the boost in Russian capabilities the move to Hamadan represents,” The Saker remarked. Indeed, over the past few days Washington has openly signaled its dissatisfaction with the Russo-Iranian move.On Tuesday, US State Department deputy spokesperson Mark Toner told reporters that Washington is looking into whether Russia has violated a UN Security Council Resolution 2231 by deploying Tu-22M3s and Su-34s to an Iranian air base. In response, Russian Foreign Minister Sergei Lavrov explained to American policymakers why the Russo-Iranian decision fully complies with the international law and does not violate the resolution. “According to this resolution, supplies, sale and transfer of certain types of weapons, including combat aircraft, should be agreed with the UNSC. In the case we are discussing, there was no supply, sale or transfer of combat jets to Iran. These jets are used by the Russian Aerospace Forces to conduct an anti-terrorist operation in the Syrian Arab Republic at the request of the legitimate Syrian leadership,” Lavrov stressed. “The West is truly horrified by the deepening of the strategic partnership between Russia and Iran,” The Saker told Sputnik. “At a time when the ‘American Empire’ is greatly weakened and generally clueless, the partnership between Iran and Russia has an immense potential, something which greatly angers and frightens the neocons,” the military analyst underscored. Furthermore, “this development also clearly seals Iran’s status as the most powerful country in the Middle-East, something which horrifies the Israelis and, even more so, the Saudis. For Iran to get the Russians to commit the way they now have is a major political success,” The Saker concluded. On August 18, 2016, Tu-22M3 long-range bombers and Su-34 tactical bombers took off from airbases on the territories of the Russian Federation and the Islamic Republic of Iran and carried out a group air strike on objects of the ISIS terrorist grouping in the Deir ez-Zor province. As a result, the strikes have eliminated 5 large depots with armament, munitions and fuel, 6 control centres, a large number of militants, artillery positions and armoured hardware of terrorists. Su-30SM and Su-35S, which had taken off from the Hmeymim airbase, covered the long-range bombers. All Russian aircraft have returned to the airfield after accomplishing the combat task. Russian Su-34 jets deployed in Iran conducted airstrikes against Daesh in Syria’s Deir ez-Zor, the Russian Defense Ministry said. 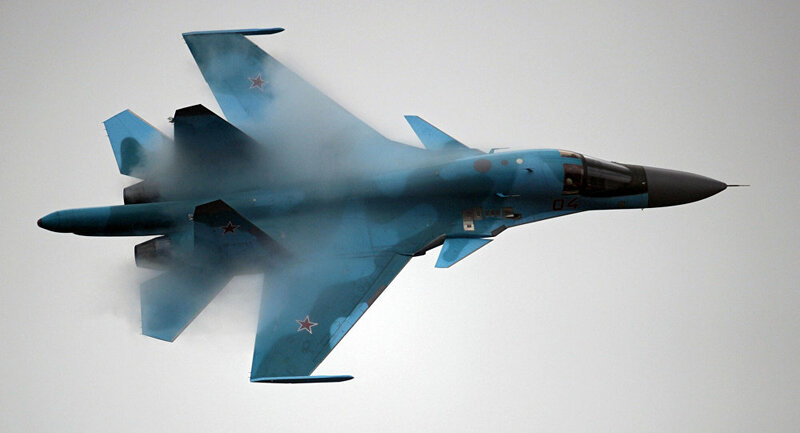 Russian Su-34 strike fighters deployed at the Hamadan airbase in Iran carried out airstrikes against Daesh targets in the Syrian province of Deir ez-Zor and destroyed two command centers and two Daesh training camps.Some 150 Daesh terrorists, including foreign fighters, have been killed as a result of Russia’s strikes on Wednesday, the ministry said. All aircraft of the Russian Aerospace Forces returned to their home bases after carrying out airstrikes on Daesh targets in Deir ez-Zor, the ministry said. The Russian Defense Ministry confirmed on Tuesday that it had deployed Tu-22M3 bombers and Su-34 strike fighters in Iran and these aircraft have already been used to carried out airstrikes against Daesh in Syria.The Su-34 fighter-bomber has been tested in the war against Islamist radicals in Syria where the aircraft arrived among the first Russian forces in 2015. Iranian experts have called the deployment of Russian Aerospace Forces in Iran’s Hamadan a tactically verified step stressing that this move will make the struggle for the liberation of Syria’s Aleppo more effective. The Russian Defense Ministry confirmed earlier in the day that Tu-22M3 long-range bombers and Su-34 strike aircraft took off from the Hamadan airfield in western Iran to stage airstrikes against terrorist groups in Syria.Commenting on the reports, SNSC Secretary Ali Shamkhani told Iran’s IRNA news service that the two countries enjoy strategic cooperation and that Tehran was ready to share its facilities with Moscow to fight terrorism in Syria. Sabbah Zanganeh an expert in international politics of the Middle East and a member of the Defense Affairs Commission of the Majlis of the first convocation spoke to Sputnik in an interview regarding this move. “Iran and Russia’s cooperation in the fight against terrorism in Syria has reached a new level. It is good to see that apart from a political front, this cooperation has acquired a new color in the form of reliable military partnership. Iran has given its consent to Russian bombers to use the Iranian airfield and its entire infrastructure to attack positions of Daesh in Syria,” Zanganeh said. Zanganeh pointed out that the expectation of the Russian-Iranian military cooperation is to as soon as possible eliminate the terrorists in Aleppo and around the province, so that eventually the Syrian residents are able to return to their homes. He said that considering the fact the Syrian Army has blocked the city of Aleppo, significantly advancing towards the north, one can assume that the way out of the Syrian crisis is more clearly visible now. “Russia’s role in the fight to destroy the terrorist organization Daesh is so significant that in order to block any route that the terrorists may use, the decision to allow the Russian Air Force to use Iranian bases was made,” Khani Zadeh said. The expert also noted another turning point affecting the balance of forces on the Syrian front — the recent visit of Turkish President Erdogan to Russia and his talks with Vladimir Putin. According to Khani Zadeh this visit showed that Ankara has changed its priorities in Syrian politics. “It is obvious that Turkey prefers to join the Russian-Iranian coalition against Daesh,” the expert stressed. “This factor and the deployment of Russian bombers in Hamadan testify to the success of the Iranian-Russian strategic partnership in the fight against terrorism, particularly in Syria. Therefore, placement of Russian air forces at the airbase in Hamadan, despite its brevity will surely yield results. The aim of the Russian airborne military operations is to destroy Daesh as soon as possible. Hence, it is clear that Iran and Russian cooperation with Syria will continue to strengthen,” Khani Zadeh concluded.